Health professionals attend the first module of a diploma designed to develop specialist knowledge on simulation technology. Twenty-two health practitioners attended the three-day long module. Traditionally, medicine and healthcare education involved classroom-based theoretical learning interspersed with scarce periods of clinical practice which risked compromising patient safety. With the development of computer-controlled simulation technology, practicing health providers now have the opportunity to develop and refine their skills safely on diverse and recurrent scenarios. Recognizing the value of clinical simulation in the pursuit of mastery learning, LAU’s Gilbert and Rose-Marie Chagoury School of Medicine and the university’s state-of-the-art Clinical Simulation Center (CSC) have this month launched the Clinical Simulation Diploma in collaboration with the University of Illinois, Chicago. “Practice makes perfect, but if what we practice is wrong, then we will not achieve perfection,” said Dr. Vanda Abi Raad, associate professor at the Department of Anesthesiology and CSC director. While simulation centers are starting to be developed in the Middle East, LAU is the first institution in the region to provide a fully recognized academic certification worth five credits (75 hours). 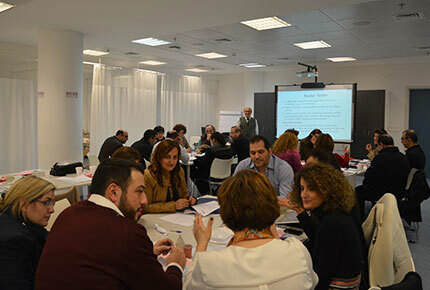 “It took one year to come up with the structure of the course, as it had to be designed for professionals who wish to develop specialist skills while continuing their career,” explained Abi Raad, the mastermind behind the diploma, who plans to open up the course to participants outside Lebanon. The adopted formula is a series of three-day modules that combine hands-on experience at the CSC with teaching and group presentations. Each module is coordinated by an internationally recognized expert in the field of medical education. The first one, which took place on January 7-9, was led by Dr. Ara Tekian, a highly respected scholar and leader in health professions education and associate dean at the University of Illinois. “In the U.S., simulation is almost a requirement, whereas it is new in the region,” said Tekian, “therefore we must ensure its correct implementation by training the instructors.” Participants in the course investigate the best approaches to debriefing – the technical term for the student’s evaluation following the simulation –, discuss effective student assessments and gain deep technical knowledge on the usage of simulation machinery.